A black couple who decorates their house every year for the holidays recently found their inflatable black Santa Claus destroyed not even a day after they put it up in their front yard. 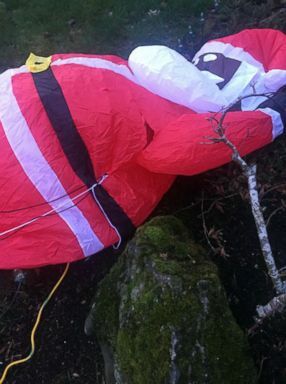 Belinda and Fritz Richard woke up on the morning of Dec. 13 to find the 8-foot-tall inflatable Claus slashed in their front yard in the small town of Bethany, Oregon, just outside of Portland. 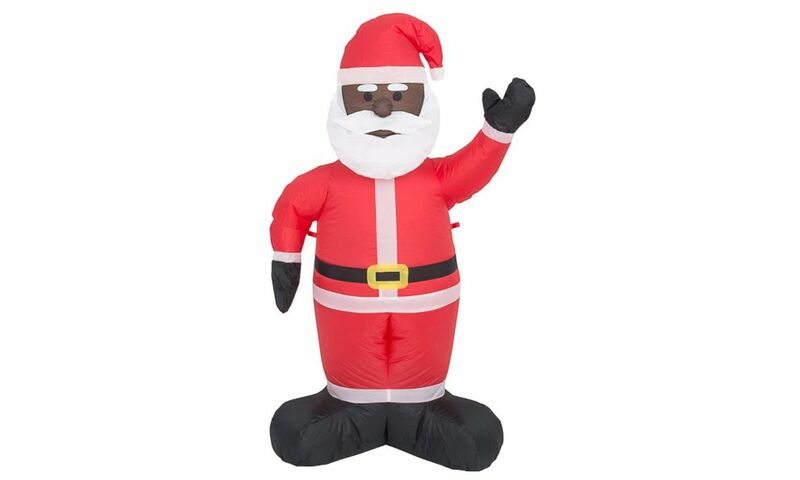 The Costume Agent Inflatable Airblown Indoor and Outdoor Christmas Decoration Black Santa is pictured in a promotional image from Amazon.com. Fritz Richard told ABC News that he had just installed the inflatable the night before, and that he assumed it had gone down because of an issue with the power source. However, after closer inspection, he discovered multiple punctures and a slash across the inflatable’s chest area. He said the vandalism made him believe it was a hate crime. “It felt like a hate crime,” Fritz Richard told ABC News, adding that there are plenty of Santa decorations in the neighborhood but his and his wife’s was the only one that was black. The Richard's black Santa sits deflated in their front yard in Bethany, Ore., Dec. 13, 2018. “I can understand someone not like a black Santa, but to vandalize it goes beyond being offended. It goes to racism,” Fritz Richard said. Deputies canvassed the area soon after the Richards discovered the slashed inflatable, but could not find any residential security cameras or physical evidence, Deputy Jeff Talbot, public information officer for the Washington County Sheriff’s Office, told ABC News in an email. The Richards told ABC News that in the 21 years that they had lived in the neighborhood, they’d never experienced something like this. Fritz Richard posted about the incident on the neighborhood social network, Nextdoor, and quickly began receiving responses from neighbors. 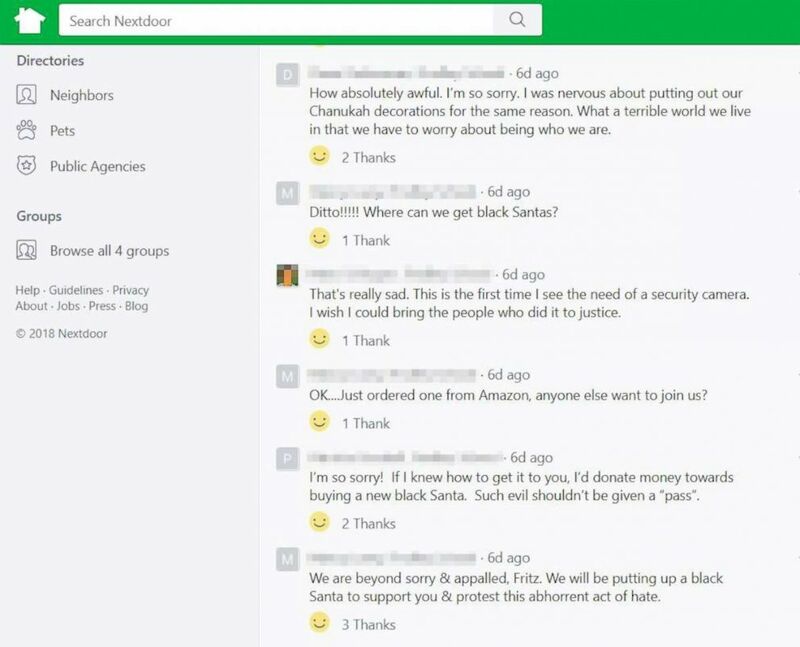 Screenshot of NextDoor.com comments regarding Fritz Richard's post on Dec. 13, 2018, after finding his black Santa inflatable slashed. Marcy and Richard Lowy, who have been living in the neighborhood since 1975 and live about three blocks away from the Richards, responded to the post right away, they told ABC News. “We ordered a black Santa and we are waiting for it to be delivered,” Marcy Lowy told ABC News. The Richards have also reordered the same Santa decoration and plan to set it up after installing security cameras. 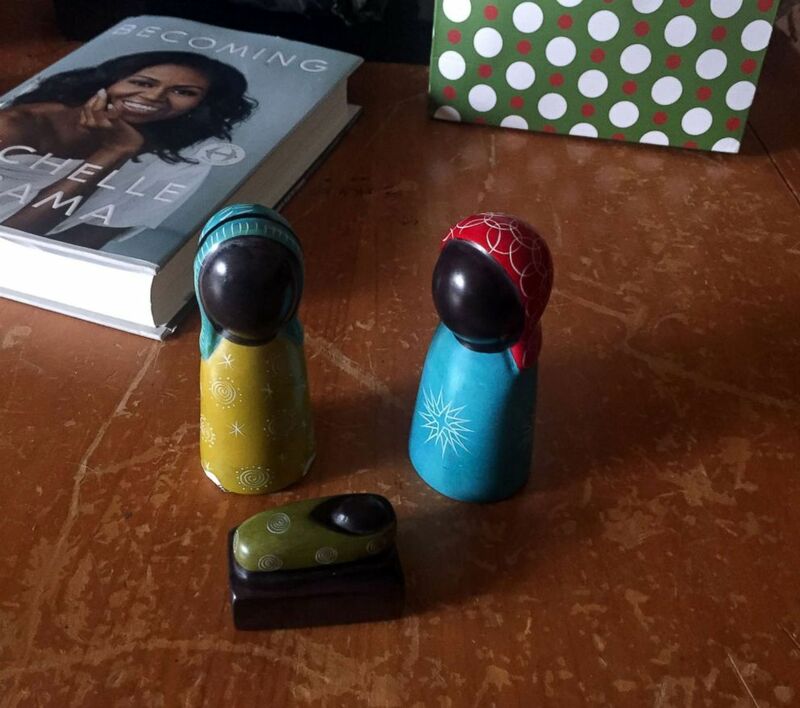 Fritz Richard's neighbor, Claire Lanfond, purchased this Kenyan Nativity set after hearing that Richard's Black Santa inflatable was destroyed. Belinda Richard told ABC News she is not letting this incident ruin her holiday joy. “We have rights and this is our property. We can celebrate Christmas the way we think is right for our family and no one has the right to take that away from us,” she told ABC News. Talbot said that anyone with information about this case is asked to contact the Washington County Sheriff’s Office.